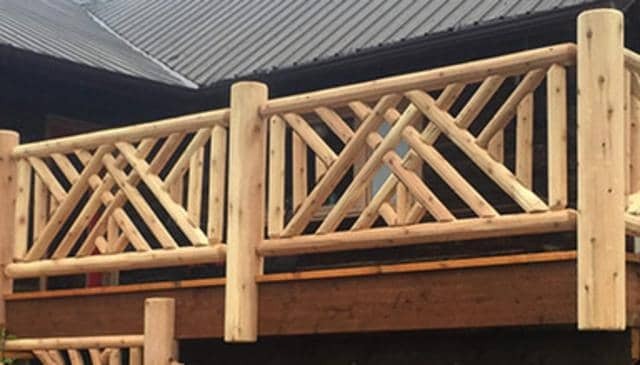 These are some examples of different styles of log and branch railings that have been hand-crafted and delivered directly to the job site by Mountain Laurel Handrails. All projects are custom built to your measurements and, of course, log handrails require more design attention from the beginning of the project. Contact me for more information on how to purchase. The preassembled sections in these log railing kits arrive at the job site ready to install. Some work is required to install this log railing kit, but as one carpenter I worked with as an apprentice said, “If it’s wood, I can fix it.” You provide your actual post to post measurements, and we work together to determine the appropriate amount to add on to the actual measurement to allow for on-site joinery. 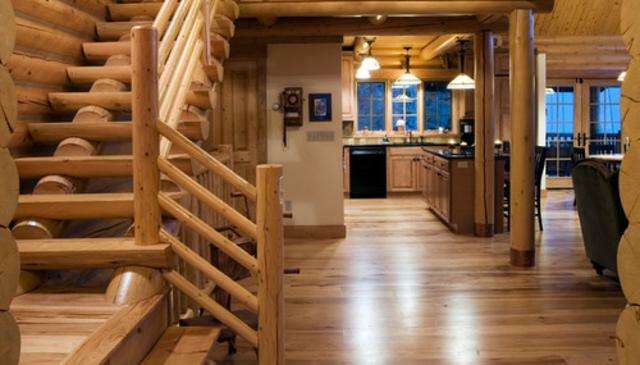 White pine log and branch railings from Mountain Laurel Handrails are an excellent choice for the interior of a home, especially a home with a white pine timber frame or one that uses white pine tongue in groove boards on the ceilings. For this project, we also sent the white pine newel posts that were installed by the on-site finish carpenters. 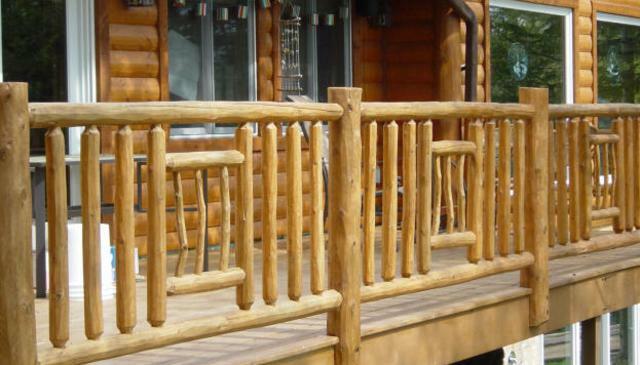 A log and branch railing from Mountain Laurel Handrails is the most unique looking railing available for your log cabin decor! Since each stick comes with its own unique contours, you’ll find no boring deck balusters on these railings. The carpenters try to use the longest sticks possible to really add character to each section. While viewing the picture above, you can imagine how this design would make a fabulous statement on your deck! 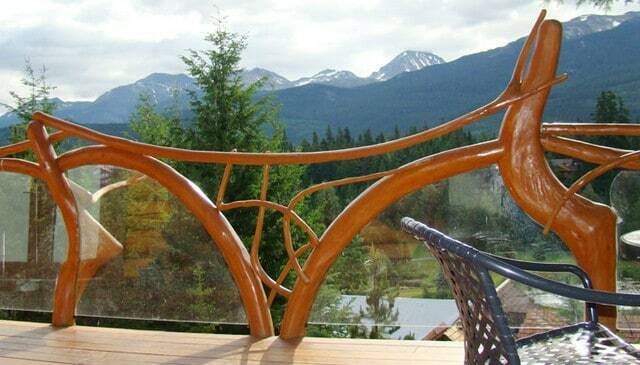 These custom white cedar log railings were precisely crafted to fit metal brackets with attachment points. The logs are white cedar 4″ rounds stained with Cabot’s Australian Timber Oil in the Mahogany Flame color. The cedar logs take on a great look and nicely compliment the mountain laurel branches. These log sections are super strong and sturdy. 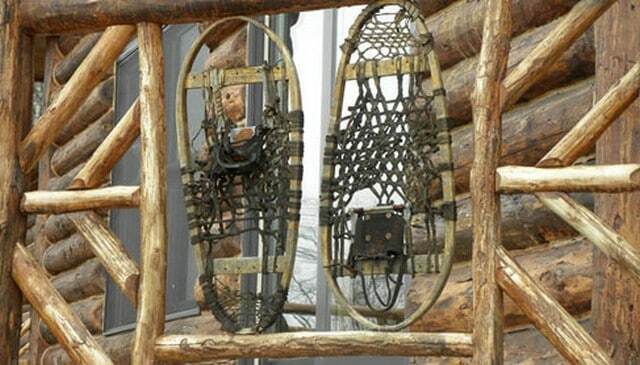 They are the perfect fit for any log cabin! 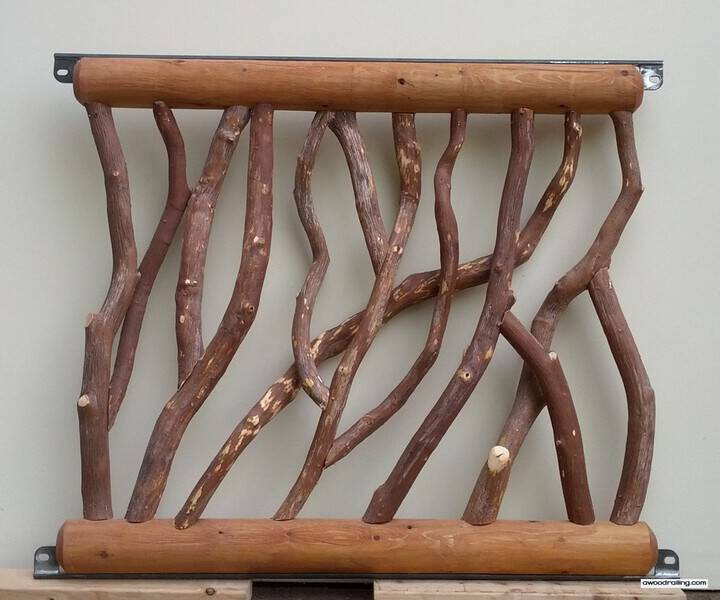 This is such a great choice for log cabin railings! Each section is one-of-a-kind. This is because of the natural variation between each of the logs, as well as that of the branches. These materials arrive at the workshop in their organic form ready to be processed. 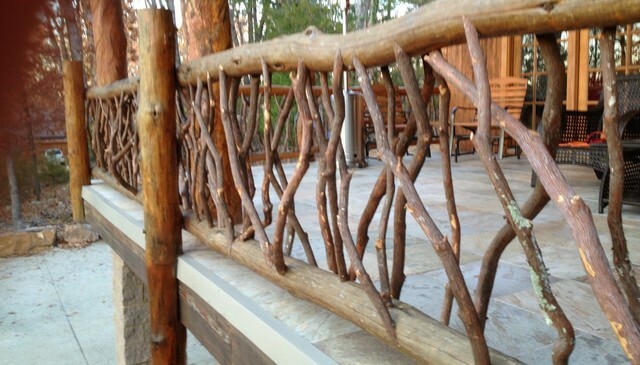 No railing design is more unique than this one that incorporates rustic deck balusters made of mountain laurel branches. In the forest, the trees and branches grow into wondrous shapes. 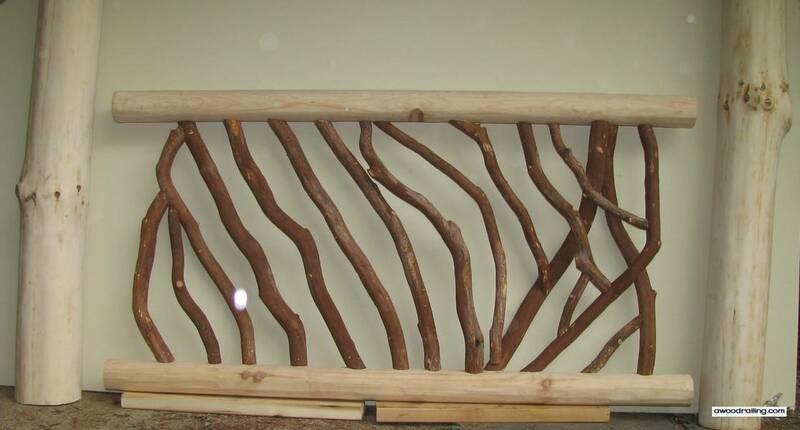 With an artistic eye, master craftsmen, from the Smoky Mountains, select each log and twig to make the best-looking log railing around! 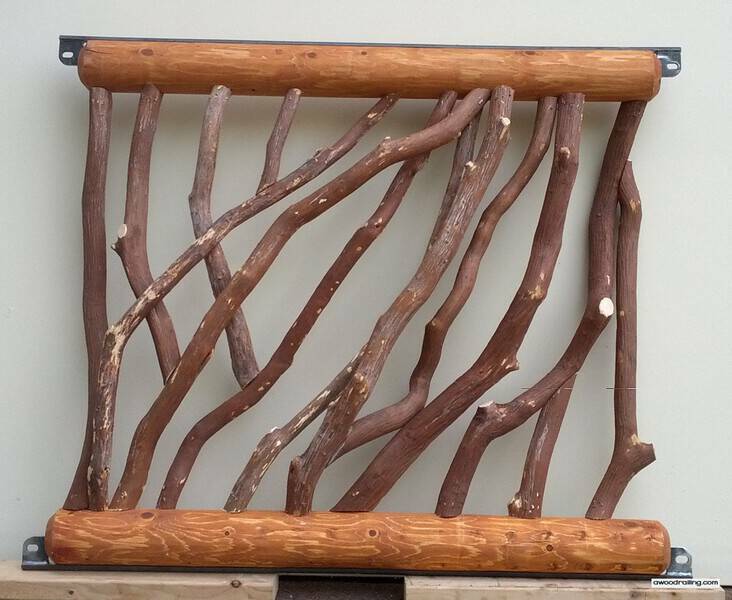 Made from black locust logs for the top and bottom pieces with the mountain laurel branches carefully fit the curve of the log, these railings require master carpentry skills. 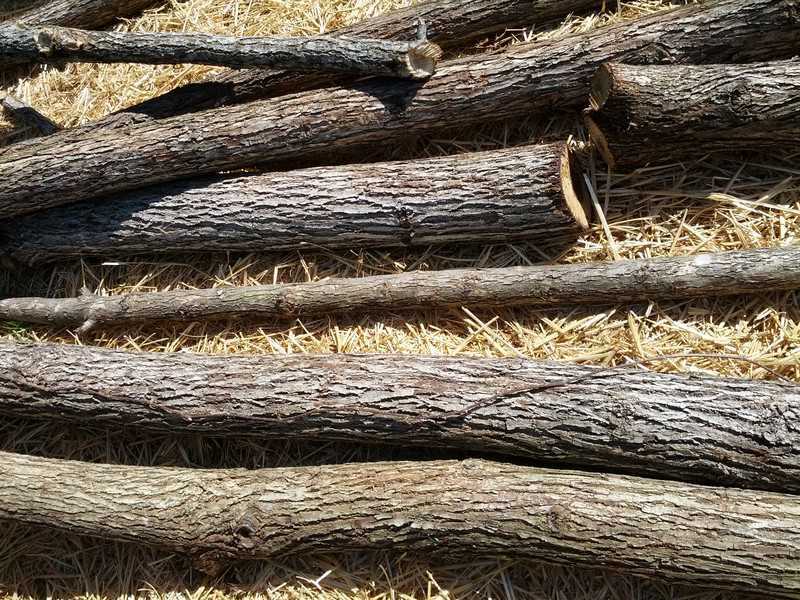 Black locust logs are available with the bark peeled off and the logs sanded smooth, or with the bark intact. 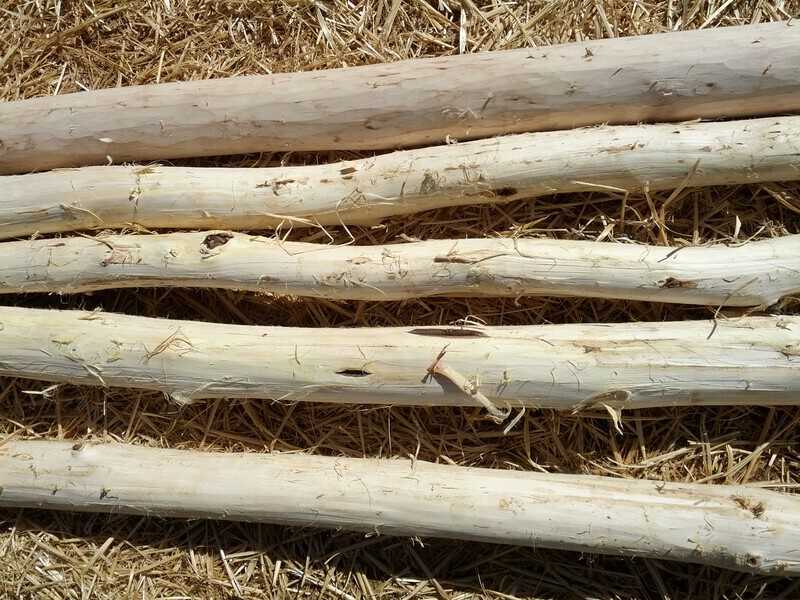 These pictures show peeled black locust rounds for the top and bottom rails with mountain laurel branch 1.5″ to 2.5″ in diameter woven between. The top and bottom locust rails are different diameters with the top rail at three to four inches diameter and the bottom at four to five inches diameter. Black Locust is a great lumber choice for a log railing. It is a hard, durable wood that is commonly used where durability was a primary concern. This includes split rail fences, posts for decks and mud sills for buildings. 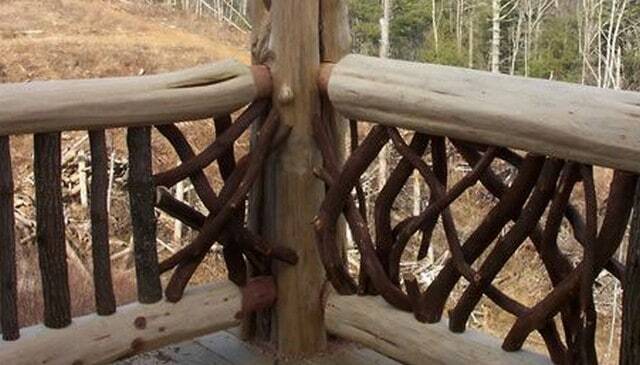 It also makes a great looking railing. We just got in some black locust for a project so now’s a good time to share some pictures. One picture is locust with the bark on, and the other is with the bark off or peeled. There are various diameters of locust shown in each picture. The bark is removed by a process called hand-hewing. Hewing is where a carpenter uses a tool to manually correct the surface of a piece of lumber. In this case, the carpenter uses a drawknife to remove bark from the logs. Wow :0 This home is unlike any other. 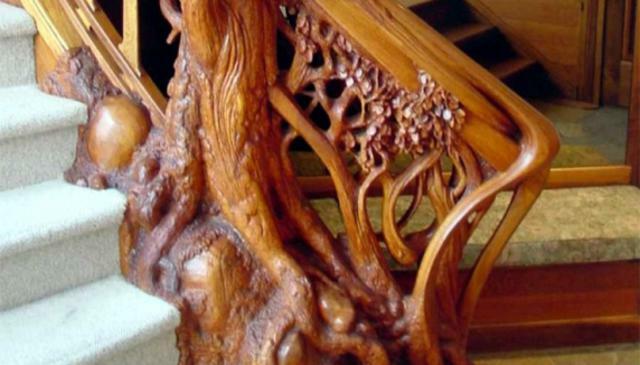 This particular staircase railing features log carvings, manzanita branches with custom cut glass inserts so that the railing is not so busy yet is still code compliant. 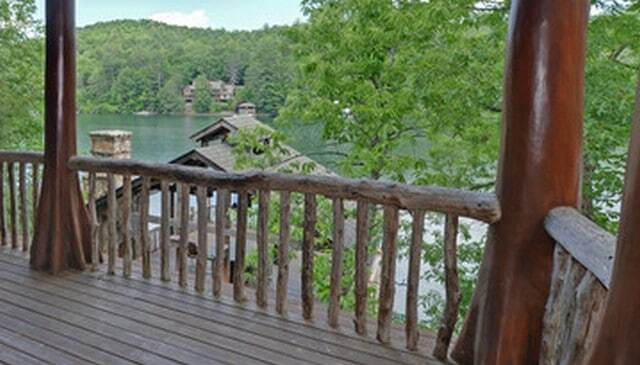 Overlooking a lake in north Georgia, this log handrail features a single top approximate 4″ diameter log rail connecting log posts with 2″-3″ log balusters attached to the decking. 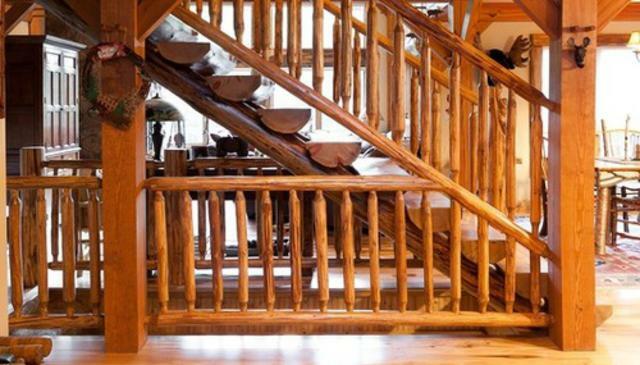 A typical example of a typical log rustic stairs railing, the posts are connected by horizontal logs with balusters attached with mortise and tenon joint. 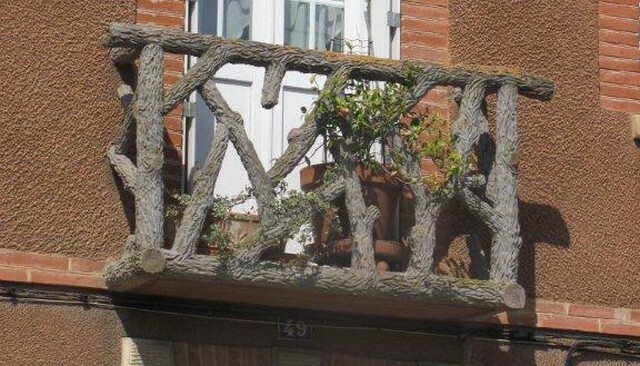 From my mom’s hiking adventure on the French Way of the Camino de Santiago comes this picture of a balcony with an open log railing. Vertical logs about 2″ to 3″ diameter with the bark on are the central part of the railing with woven branches on either end between log rails with log posts. Relax in this rustic log framed porch and enjoy the view through the branch railings, made here with 6″ locust top and bottom logs connected with mountain laurel branches. The simple elegance and bold nature of this railing reflect the strength and confidence of the American pioneer spirit, quietly stated in open diamond shaped railing and strong posts that invite the forest to this secluded log cabin. This amazing stair railing idea combines three round logs as the rails with vertical metal balusters below a pine cone motif metal insert. An amazing handrail for an amazing view! 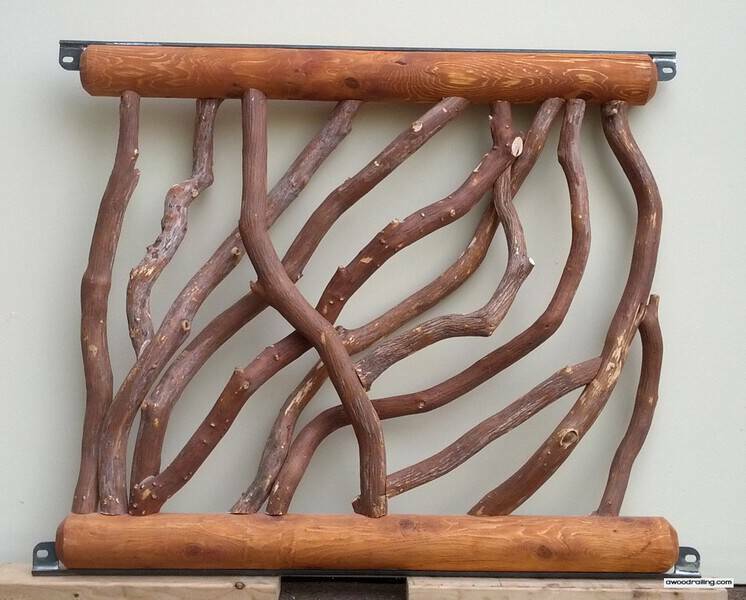 This log and branch railing includes curved cut glass pieces inset among natural and organic shapes made with natural logs. Large diameter, at least 12″ log posts are connected by somewhat smaller log top rails filled with sections of vertically strung cable railing. Eight-inch diameter log posts are connected by log tops and filled with chicken wire in a rustic design that also lets in the view of the scenery beyond. While this railing uses snowshoes, you can choose anything that you’d like as decoration for the central panel, whether it be sports memorabilia or something matching your decor. Hickory logs are left with the bark on which gives a whole new dimension to the rustic texture and feel of this log stair railing. A fresh change of pace from the normal staid vertical style, this railing employs the logs in a horizontal pattern to extend the visual perspective. This log railing alternates the usual rectilinear, orthogonal usage of the pickets and devises a new pattern for a different view. 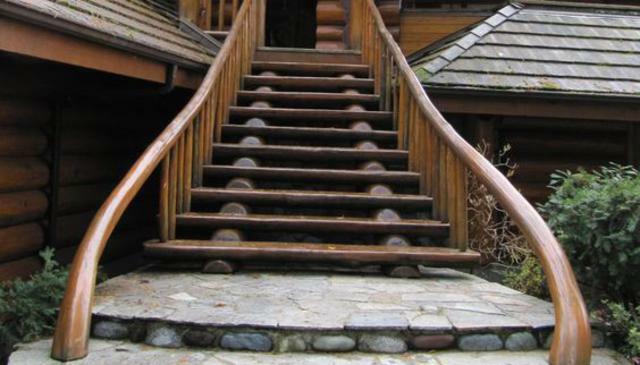 This log handrail springs from the ground by this exterior stairs and makes a continuous run to the top as if it grew in place! 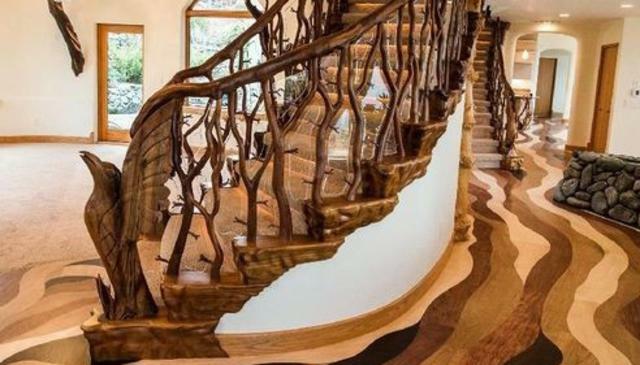 For something totally amazing and unique, contract with a local woodcarver to create a personalized piece of art for permanent display on your staircase. 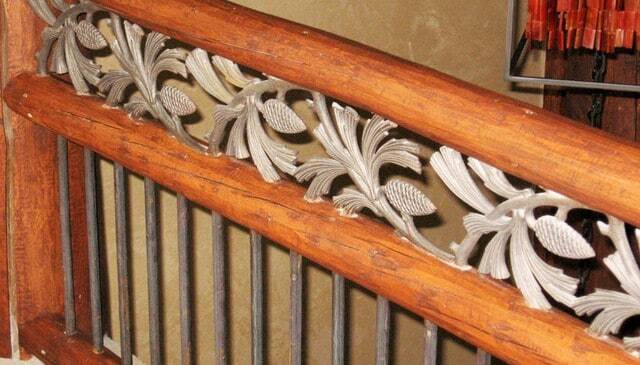 This log railing features a central inset piece that is a smaller version of the main pattern. It would be cool to see a similar railing shaped like a nautilus. 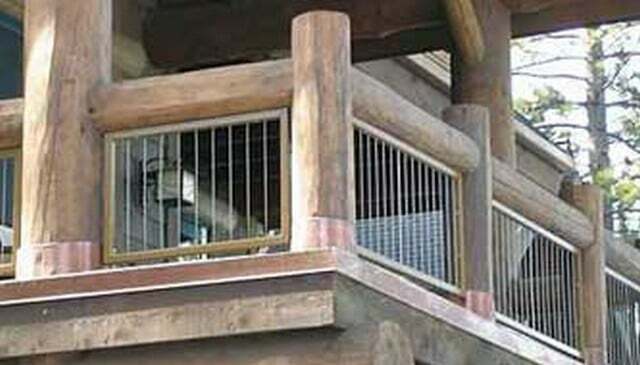 Log railing is a style of rustic guardrail where logs, or rounded pieces of wood, are used as structural elements. The main structural elements are the posts and the horizontal members that connect them. Log railings typically have larger diameter logs as the posts, with 6 and 8 inches being the most common sizes although some log posts can exceed 12 inches depending on the application. Log stairs also use rounds for the structural elements like stringers and treads and will often feature a log handrail. The infill is located in between the top and bottom horizontal logs that span from one post to the next. The typical residential handrail connects the top and bottom with vertical balusters or pickets, usually with pressure treated 2×2. Log spindles are the norm, but there are many other options like branches, cable railing, glass panels, metal inserts and much more as we’ll see below. 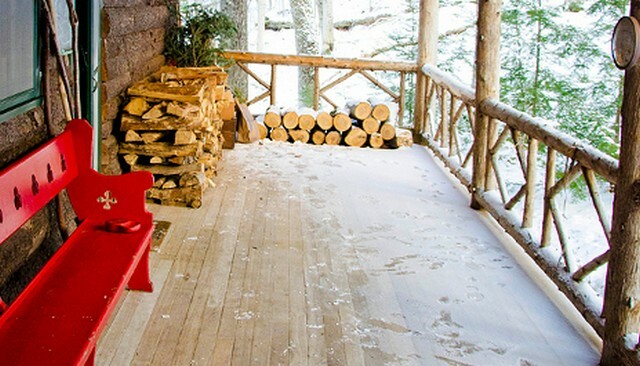 Is my home right for log handrail? 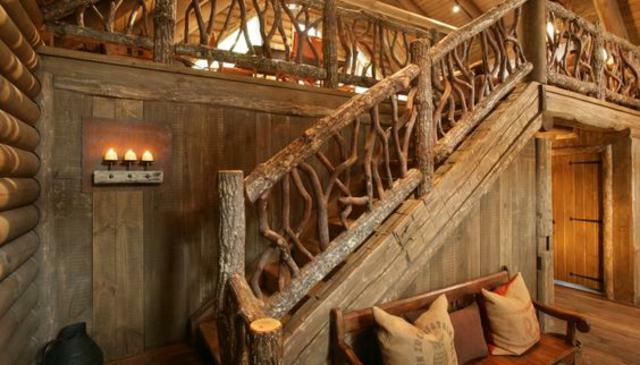 A rustic log railing is an excellent way to set your home apart from the pack! They are at home on your deck, log cabin porch and patio or any part of the exterior of your home and are also perfect inside on your balcony, loft or landings. 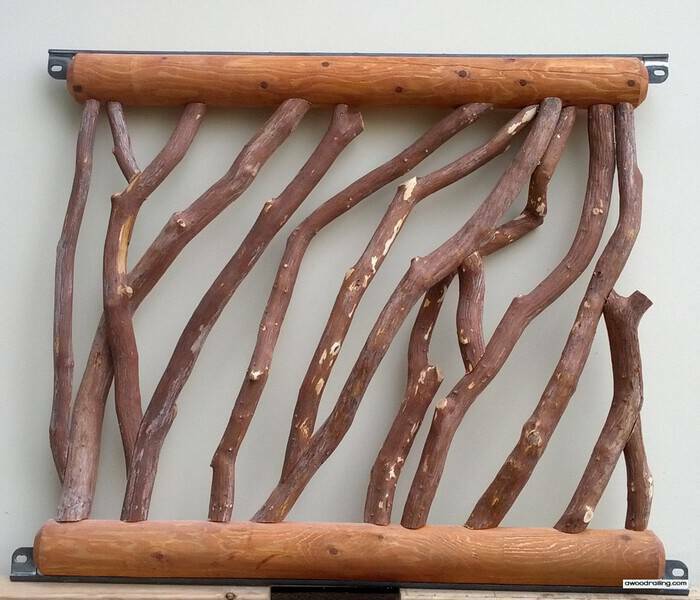 While you could have a railing made from conventionally cut and smoothed boards of wood or constructed out of other materials such as iron or plastic, there is something truly special about a railing made out of a simple log. The log railing itself gives your deck a taste of nature that it couldn’t have otherwise. The feel of real wood under your hand as you lean on you deck is utterly unmatched by any other building material. A real log also has a plethora of textures and visual accents ingrained before any work is done to it at all—true natural beauty incarnate. The form of the log itself—not quite precisely flat in any direction—will be different from every other log railing out there, ensuring a unique look for your deck. If you have any kind of natural round wood in your home, it’s a strong point in favor of a similar look in your guard rail. Perhaps you have a timber frame great room showcasing a log staircase with peeled half rounds for the treads… A log stair railing is the natural choice! 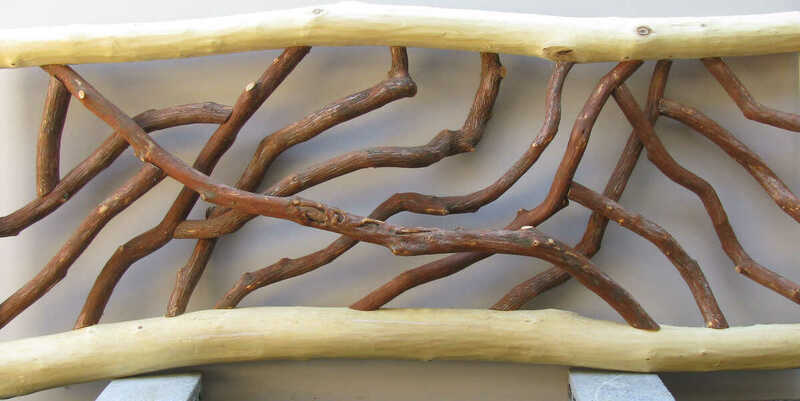 What are some considerations for log handrails? Choosing building materials is hard work. Unlike going to the grocery store for a box of cereal, home building decisions are more expensive, and you have to live with them for a long time. Literally. That’s why it’s important to consider similar points when selecting any building material. The most important aspect is that of architectural style. Maintaining strong motifs throughout all design elements is crucial to having a house you can call “home” versus a soulless McMansion This is why it’s important to match the style of a railing to your broader architectural design goals. Style and aesthetic will guide many design choices including material and pattern which we will look at examples of below. The material in this case refers to the species of wood selected as well as if the bark is left on or peeled off to expose the wood underneath. Paint or stain selection will also be guided by the overall decor. For the most part, they are not painted or sealed from the conditions because it detracts from the natural look. One option is to source materials like cedar and mountain laurel that are naturally resistant to the elements. The pattern of the infill is variable and can generally be changed to match whatever the designer can dream! Longevity is a good trait, and good handrails need to be strong to support actual use. Wood species is important for longevity outdoors with the best choices being locust and mountain laurel. White pine should never be used outdoors for any structural application. Since most logs will have more meat in their wood than the average site-built handrail, it’s a safe bet that they will be stronger overall as long as they are installed properly and securely fastened. 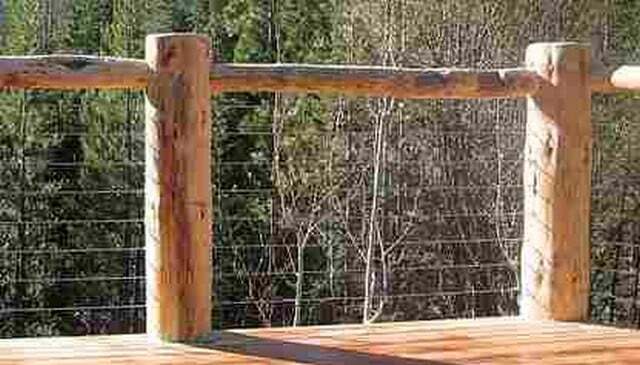 How to install log railing? There are many ways to attach the railings to the posts. Regardless of the detail, either method is difficult as the railing sections must be installed concurrently with the posts. This means that you have to start installing at one end of the railing, usually up against the house. First, install one post, then install one railing onto the post with temporary support under the loose end. Once the top and bottom piece of the first side is fit to the post, then start shaping the top and bottom of the other side as well as the post to fit neatly into place. Repeat this process all the way around. The first joinery detail involves drilling a hole, or mortise, in the post. The end of the log railing is shaped into a tenon which then fits tightly into this hole. Specialized log tenon cutters are required to complete this process or it can be done by hand with other shaping tools. Screws are sometimes used to secure the joints. Another route is to shape the ends of the railing log to match the curve of the log post in much the same manner as the mountain laurel sticks are to match the log top and bottom. This process of shaping the end of one piece of wood to match the curvature of another is called coping. Needless to say, there are many jokes about being on a job site and ones ability to cope… or not!